Exceptional service is one of our core values at Acacia Immigration that we live and work by. Below are some words from past clients talking about their experience with Acacia. Thank you so much for your help for processing my visa. We are really happy. At last I got my PR. All of your hard works finally bring success. I would like to take this opportunity to thank you very much for your support, advice and service. It definitely was a long journey, but worth every bit. I wish you all the best wishes and I will definitely go back to Acacia for professional service and advice again in the future and would recommend my friends to do so. Lily - That is amazing news! You guys are miracle-workers! Thank you so much for all your help, I am speechless! This is great news!!! First of all, I want to thank you sincerely, your help and professionalism have been amazing. I also appreciate that you handle my despair moments well, it has been such a process. Once again i'd like to mention that the level of expertise and delegation your team offer to clients is highly appreciated. That's amazing news!! Sorry I missed your call earlier. Thanks a lot for all your efforts during the last year. We doubted to get this all done through an agent because of the costs, but it's been 100% worth it all and we would definitely recommend you guys for taking away all the effort. Thank you very much for your help in bringing my dream to reality! I was waiting for this for 4 years! Thank you also for giving this additional information. I will of course look into becoming a citizen. Once again please accept my sincere thanks and deep appreciation for your invaluable help and wonderful job. This is the best Christmas gift I could receive! Wish you a Merry Christmas in advance. Thanks as well for your support, calmness and the focus you bring to the job. I believe your other clients will appreciate these characteristics too. Thank you. How likely is it that you would recommend Acacia to a friend or relative? Extremely likely - 10/10! I had a clear and informative call with Ami and was very happy to have been directed to the next steps. Thanks a lot for your prompt response. It's a great news. I really appreciate. Please say thanks to Lily and the team on my behalf. You guys were wonderful throughout the journey. Thanks for the great news. Really a big relief and all our hard work did eventually pay off. I would like to thank you for your advise and support throughout the application and waiting process, really appreciate it....Thanks to you and Acacia! We are very very happy. Thank you so much for all your hard work and support. Thank you so much for your guidance and support for last one and half year. It would be really difficult to get this PR without your support. I wanted to express my gratitude to you. I first made my consultation with Acacia when I was still on a student visa and was unsure of what step to take next, since I wanted to become a Permanent Resident after I finish my studies here in Australia. From then on, after my consultation with them, I was enlightened and was given what my options were and some action plans. From my journey as an International Student, to attaining my 485 Visa and undergoing the Job Ready Program, up until I finally got my PR, Acacia has always been precise and very approachable during the whole process. Thank you very much to Ms. Grace Floramo, my Immigration Consultant for being so organized and meticulous. She made sure that all my documents were spotless before lodging my family's PR application, which has given me peace of mind and made the whole process smooth sailing. Oh my God! Thanks for informing me of this wonderful news and going out of your way to even call me! Sorry, I was in a meeting so I couldn't answer your call but truly, I can't thank you enough for all the effort you have put into this! Looking forward for the Dream with Acacia! I'm so happy that my application was successfully approved with your amazing support Nicole. Your valuable efforts, time and precise advice's made it possible in very short time (in just 45 days ). I'm thankful for your fabulous work in getting my 485 visa. In fact i'm still really grateful for resolving my complex previous visa condition. My sense was true with Acacia, you have done great job guys. Many thanks for you Mr. Mark Webster, and Gunjan and for all of Acacia professional and kind members. Looking forward and working towards my PR Dream with Acacia. I approached Acacia Immigration very late into my visa enquiry, and there were several hurdles that needed to be crossed before making my stay in Australia official. What I most appreciated about my case manager, Nicole, was her no nonsense attitude. When dealing with the legalities of immigration, there is no place for optimism and hope. So it is of paramount importance to have somebody who knows the intricacies of the law, and the gumption to deliver it you unabashedly. There was a lot of nail biting which went on during the process, but having come out of it, I'll say I'm very fortunate to have had Nicole manage my case. I'm sure she'd agree that it was always touch and go with me, but hope she can claim this one as a very good victory. I wish to thank you deeply for all the support you granted us those past 20 months. Some steps were very difficult for us and you helped us to calm down our stress and go forward with the application with great kindness and professionalism. We have been waiting this moment for 7 years and are filled with joy with this news which will stay one of the most memorable in our lives. Nozomi called me at work with cries of happiness. You can be sure that we will recommend your services and that we will not hesitate to get back to you for our future application that will be the Australian citizenship. I'm Kalhari and I was on a bridging visa since 2015 for a 457 visa refusal with another migration agent. I was on a very hard time for more than 2 years. I got few consultations from you last year and you have given me the best option for me to apply for a Tasmanian 489 visa. So I have applied for EOI on mid April through Acacia immigration and my agent was Ms Gunjan Mullick. Today I got my 489 grant notice. I have no words to explain how happy I am today. It took less than 5 months for the whole process.All that is because of Ms.Gunjan Mullick and you Ms Natalya. I highly appreciate Acacia immigration members for the valuable work you guys have done for me for a reasonable cost. I highly recommend Acacia Immigration. This is such wonderful news, glory be to God. I need to stop smiling now before guys here in the office start wondering what is up with me. My many many thanks to you Gunjan for the tireless effort towards this visa,may God bless you and your family eternally.You have been so great. Many thanks also to the whole Acacia fraternity especially Natalya, please pass my regards to them. Thanks again, it has been a long prayer journey. Thank you for the great news. We are definitely very satisfied with Acacia and you services personally. Rest assured that we will get in contact with Acacia Immigration Services again very soon to start our road to Permanent Residency. Thank you again Lily for all your assistance on getting our Visa 485. All the best. Thank you for your email and good news. I cannot believe that it was approved so soon without hassles. A million thanks to you and the whole Acacia team. You guys help us from the very beginning . Thank you again and more powers to you and the team. I would like to thank Mr Mark Webster and all the wonderful people at Acacia, especially my case manager, Ms Gunjan Mullick for their professional support. For sure, without Mark's careful consultation and Gunjan's concentrated support, obtaining the Australian Permanent Residency could have been a very very challenging journey for me. With the ever changing immigration regulations within Australia, Acacia's professional support made this Permanent Residency journey conclude successfully for me. Thanks Again. Wish you happy days and years ahead. Thank you so much for all of your advise and assistance. Wish you a lovely evening and if I need any assistance in the future you will definitely hear from me. Thank you so very much for everything and for being so supportive and understanding throughout the whole process. Thank you Acacia Immigration for guiding us throughout the whole process for myself and my husband's Permanent Residency pathway. It genuinely wouldn't have been possible without your consistent help and advice. And a special thank you to Lily our Case Manager. She is very patient and took utmost care and cleared all our doubts and answered all our questions with a smile on her face! I will definitely recommend Acacia to everyone I know! BIG THANKS for your hard work and effort, I can't describe my words for your kind help. I'm really grateful for the kind and amazing support from your side :'))))) . I'm happy that I took my decision to go with Acacia in my hard time. Many thanks for Mr. Mark Webster and Acacia staff members. I don't think I would have a PR visa were it not for Acacia. Knowing what visa options were worth pursuing and getting navigated through the process by people who know exactly how to prepare every element takes the risk and guess work out of it. And the added bonus - I got to deal with Nicole, she cared as much about a successful application as me, and was as enthusiastic! I was so happy when receiving your notification. I still couldn't believe the fact that my 457 visa was granted 1 working day after the medical exam was done and overall it just took 5 weeks after the lodgement of the appliation. This is amazing.This satisifies me and my employer mostly for the urgent business need. Your efficiency and professionalism impressed me really. I want to personally meet and thank you when I arrives over there , Michelle and Acacia! Hope my following 186 case will go as smoothly and fast as this time. A BIG Thanks to you Nicole and sorry for late reply. Yes, I got the good news and I am absolutely delighted. Thank you very much for all your efforts and to help out throughout this process. You will be glad to know that, recently I got a job in an Event Management company and since the March, I was extensively busy with those new changes of my life and I forgot to make a reply and I am really sorry for that. I really want to come to your office and say thanks to you. If it don't bothers you, can you please provide me a specific time (preferably in the morning) so that I can meet you once again and say thanks to you. Since I contacted you, I believe you took the entire responsibility of my visa process and I never had to take any headache regarding my visa. Thanks Nicole for tolerating all my frustration and giving me all your time and support during my visa process. Hope to see you soon. Thank you for the email, great news indeed, we are both very pleased to hear it. We have been travelling all around China, so signal hasn't been optimal in some areas, just heard your voice mail. We are boarding the plane to go to my home city soon, I'll get back to you regarding next steps in the coming days. "From the onset of our first consultation, we were impressed by the approachability and vast knowledge and insight Nicole presented us. As we have a rather complicated case, we had been consulting with a number of other immigration agents beforehand. Nicole's experience and initial impression won us over and I'm proud to say it's the best choice we could have ever made in terms of immigration consultation. Throughout the following up consultations and execution, Acacia and Nicole were prompt, professional, and proactive, three big Ps that a lot of other agents are lacking. After a long and stressful waiting period we finally achieved our desired outcome. We would highly recommend Acacia and Nicole to anyone seeking help and advice in their immigration journey. I want to say thanks once again - for words cannot express my feelings, nor my thanks for all your help. I know the journey is not over but this is a step forward. We will discuss the which option will be best for me. I am so happy when receiving this information. This means that I am now Australia Permanent Resident, right (I just want to make sure as i don't believe it is so soon, I guessed it should take 2 or 3 months). Thank you so much Gunjan and Acacia! I would like to thank you for all the hard work and support you provided me in this journey and helping me get my PR. "Acacia was able to get me something I deemed impossible: my Australian residence visa. They can deal with any hurdle coming your way in a highly creative manner." "Following approval of an internal transfer to our Australian office, Acacia made sure that my visa application was processed within several weeks. The team was very helpful with any questions I had and contacted me on a regular basis regarding visa-related updates, even happy to help several months after my visa had been approved and issued." "Thanks to you and your team for the tremendous service and consultancy you gave us with immigration advice during our office setup in Australia. By completely understanding our needs and legal requirements you made the complex process simple for us." Thanks so much for your support and professional services with my application. I know my case was not simple as it had special circumstances due to changing school and my health issues. The final outcome of my application was successful because Acacia experience in this matter allowed you to handle my case to best standards and full filled my expectations. I will be in touch with you when I feel ready to add my son to my 485 visa. Thank you for all your help with obtaining a permanent residency for me and my family. This is one of the best days in my life journey and thank you for being part of it. Your skills and professionalism undoubtedly helped this process to go smooth and successful. I wish you best of luck as well in your profession and will be please to work with you again if I will have a need for it. Thank you to Acacia Migration as well for your service. thank you for all your precious support, fast and perfect! Have a great weekend ! Thank you very much for assisting in this visa. You guys are very professional and the one anybody can trust for visa services. I was assisted for my Temporary Visa by you in the past and I was very happy at that time too and this time is also very happy. Acacia is excellent in all aspects but the most thing I liked is the caring for me as a client. No matter what query and how many times, you replied my emails and answered calls and voice massages and tried to help me in each and every things. That is amazing!! I am so glad that somebody like you guys are there to help us in a visa case and we can trust 100%. I will come again, am recommending people and will continue to do so in the future as well. Thank you Acacia and Mark Abalos from my heart again for your kind assistant. This is to confirm on the receipt of the documents and my gratitude to you and acacia. No words could express my happiness at this moment. Anyway, again thank you very much for all the effort put onto my application. I really appreciate the end-to-end service I got from you. Mark Abalos did take care of my visa issue from the very begging to the very end, and it made me to not to feel left alone in this quite long period of time. I will recommend you to my friends seeking immigration assistance, and will keep in touch for my later immigration matters for sure. Yes, you've really made my weekend & hoping to hear second big news soon as well. Once agin thanks to you & the whole team of Acacia. Sorry for the slow response - I have been very busy celebrating. Thank you so much for the support!! This is great, life-changing news, and I am surprised how fast it all went. Thanks so much Josie - that was very quick! 10 days!! Thank you very much for your help. I will remember rest of my life about Accacia. Wow..!! Thanks a lot for your kind help and guidance throughout the application process, lodgement and the support which we got as in with updates, requirements, etc. Initially, we thought it is big hassle to apply and get 457 visa. However, Acacia made it really very smooth process from Sponsorship to 457 visa grant. Thanks again for your assistance in getting the visa. Thank you for your great help and support regarding my skill Independent permanent visa application. I appreciate your and your entire team cooperation during the process of my visa application. I agree that you and your entire team are working in a great and professional way and you try all your best to fulfil your client satisfaction. Please pass my regards and thankful thoughts to your entire team. I would like to take this opportunity to thank you all for the immense support and guidance you gave me throughout last four months. Special thanks goes to Mark Abalos whose my case manager who guided me entire process,without your guidance, advices it won't get successful. Thank you very much again and I'll visit your office when I arrive to Australia. It would not be possible (to get PR) if we had applied from any other agents.Really thankful to Mark and all the team. Excellent !! I wanna especially thank Mark for being diligent and helping as step by step along the way. It makes us feel safe that the answers and alternative solutions are from Mark-the expert. Excellent, Money Well Spent . Keep up the good work! I've got friends asking about you guys already! They think my agent is awesome! I do appreciate for your assistance to get the visa for me and my family. That is a truly great success in my life thank for your innovative and excellent service. Your services are honest and transparent that is rare in the area of providing immigration services. My friends recommended to me Acacia like one of the best immigration company in Sydney, I'll be also recommended your company like one of the best in Sydney. Many thanks to you and your team for helping me to get an Australian permanent visa. All work had been done on time. Acacia team know value of team and each staff is reliable. Now I can say my money is worth it to spend in Acacia. I will appreciate you and my best wishes are always with acacia .I hope acacia will get more success in coming year. Thank you! This is a wonderful news. I am so happy. Me and my family are so grateful to you (Ella), Natalya, Jing, and the entire Acacia Immigration team for processing our case and helping us reach our dream. Thank you so much. I must say that Acacia Immigration is by far the most reliable and efficient immigration organisation out there in Australia. The agents/lawyers are very helpful and kind towards their clients. The positive repute of Acacia Immigration is spreading fast in this region. I wish you and the entire company more success. Hopefully when i fly to Australia, i will visit Acacia Immigrations along with my wife to formally say thanks and would surely get a snap with you guys. I would like to thank Acacia with the process of my visa application and most importantly thank Marianne Calacala for being an excellent case officer keeping me up to date and providing reassurance at all stages of the application process. Your truly great! Thank you! Perfect! Fitted to my need at that time. Mrs. Natalya Khodan first up explained clearly and concisely what has to be done considering my situation. Then she me guided to my case manager. I haven't had any headache. Thank You ACACIA. Thank You Mrs. Natalya, Jing and Mrs Ella and of course Mr. Mark Webster and Julia at front desk. Many thanks for this and for your work in preparing the visa application. As for a testimonial, suffice to say that I was very happy with the speed and ease of the application process. Everything was clearly laid out and easily understandable. I was very pleased with the process. First I thank the Lord for leading me to your office, it's not an accident but God's will for me to know you and have my application lodged by you. It was really amazing. Thanks to you and to whole ACACIA family for helping us with this application. I just remembered how worried I am before about this and you have been so supportive and positive that everything's will be alright. Thank you so much. To show my gratitude I personally have recommended ACACIA to all my friends who have migration concern. Again Marianne my sincerest gratitude to all of you. More power. To God be the glory. I can't thank you, Justine, and the rest of the Acacia team enough for doing a wonderful job in assisting me in getting my 487, and now my 190 visa. Without you all, I'm pretty sure I'll be drowned in my confusions and boiling questions. I'm so glad that I chose Acacia! Once again, thank you, and I wish the team all the best of luck in any future endeavours. I'm really impressed at how thorough Acacia knows about the immigration laws and provided me the best and clearest pathway to permanent residency. You get what you pay for - I'm totally satisfied with what I get for what I paid. I've already recommended Acacia to a few friends and my sister. The team is very friendly and professional. Both the Case Manager (Jing) and the Paralegal (Ella) displayed a higher degree of professionalism and they were equipped with up to date knowledge to answer all my queries - clearly and accurately. Thank you so much Jing! I just could not express how grateful and happy I am with the outcome! The decision was really quick! Your team at Acacia are really excellent! Had I not consulted with you, I still would have been running around in circles. Kindly express my sincere gratitude also to Ella, to the whole team and most especially to Natalya. You are all very efficient, professional and supportive. I would highly recommend your services to my relatives and friends. Once again, thank you very much. I look forward to dealing with you again in the future. I would like to express my gratitude to ACACIA Immigration Australia for the help, support and positive results regarding my Permanent Visa application. Thank you for your careful assistance, kindness and professionalism, for always being there to answer every single question we had. Thank you for all the friendly help and for the letting me feel always confident to have made the right choice stepping into your office. It was pleasant working with you, I wish you the best in future cases. I would strongly recommend your service to anyone for any immigration matters. 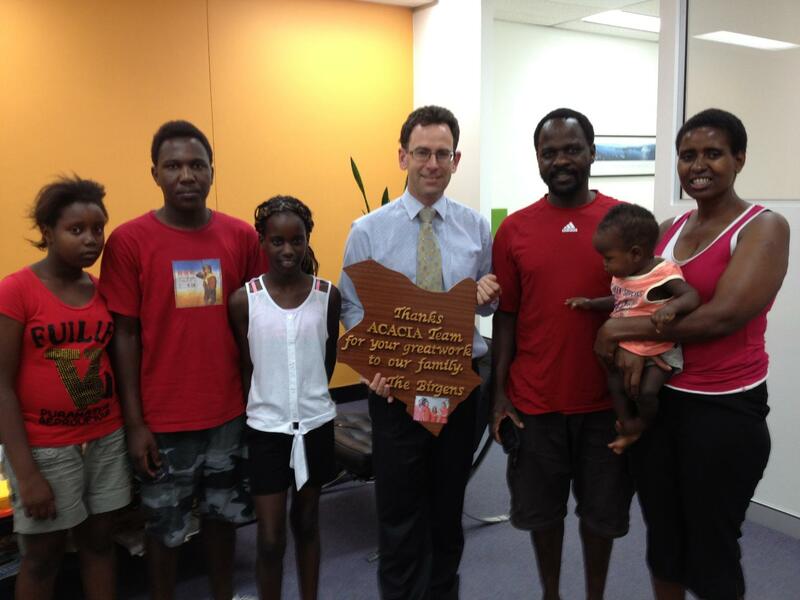 We must express our full satisfaction with professional services of the Acacia Immigration Australia. Thanks to Natalia and Marianne we have obtained a visa, which will certainly help us towards the fulfilment of our dreams in Australia. I am extremely thankful to Marianne, who worked intensively and with passion on our case. I strongly rely on Acacia in my future matters. We've worked with the Sibbalds since 2003 and are please to announce the family are now permanent residents of Australia! The Acacia team is absolutely fantastic and professional. I am a person with loads of questions and more often than not, I bombard my case officer with these queries - the team was friendly and answered them very promptly regarding my options and situation. I would highly recommend using Acacia's migration services to anyone who is looking for a reliable and brilliant service. Let me take this chance to thank the Acacia Immigration Team for the great job you did for us. We had a very complicated case and we never thought anybody could assist us to get a visa. Acacia, you proved us wrong. Because of your immigration expertise, we are now proud permanent residents of Australia .Once again, Thank you and Keep up the good work you are doing. We definitely recommend whoever wants to come to Australia to talk to Acacia Immigration Team. Natalya, I would like to thank you for all your efforts and advices. I am very happy with your organization, team and service. Your organization is excellent and it was my pleasure to be your client. Thank you again for all of your help and support. Wish you and your company all the best. Being professionals we did not want to leave any aspect of our migration to chance and selected Acacia after having received ample positive client and friend recommendations. Darren and Marianne at acacia guided us from the inception of our application process and helped us obtain and classify the relevant documents and submit our application in time. The high quality of the documentation resulted in a very expedient positive result, which delighted us very much. A truly great team whom we have now recommended to our other friends and family. "Our Australian employer had successfully used the services of Acacia before and he recommended us to get some help from you too. After eight months hard work, dozens of e-mails and countless number of papers we got our visa granted. That was one of the happiest days in our lives! We don't know how we could have managed this without you and your team. We want to thank you Mark for the great work you have done!" "Natalya is the best migration service provider I've ever had." "I first approached Acacia Immigration for advice by email on a de facto spouse visa, and was impressed by the speed of reply as well as the quality, including a documents checklist. Further queries were also quickly responded to which led to my engaging Acacia to act on my behalf on my arrival in Australia. My application, which was not without complications, was subsequently approved within 6 weeks of lodging thanks to good information-sharing and excellent follow-up by Acacia's principal, Mark Webster, and staff. Furthermore, I was able to move onto full Permanent Residency status immediately rather than the 2-year temporary visa - an absolute bonus. I would recommend Acacia Immigration's services to any prospective client, whether applying from overseas or within Australia." "Natalya is an efficient and well organised individual who provides a variety of clever options for clients with immigration needs. Professional service at a cost effective price is an important combination and it is refreshing to see Natayla be able to offer this." Mark Webster handled my visa application very professionally. The Skilled Independent class of visa is not the simplest to obtain, but he managed the process with care and diligence from beginning to beyond the end, in that he was able to provide assistance with the bureaucracy after my arrival. It was particularly helpful that he was able both to send and to receive documents via e-mail. I would certainly recommended his services to anyone applying for a visa. "I recommend Natalya for her migration services given her expertise in handling case-by-case situation to better understand the client's need and respective best-suited opportunities. She advised me during the critical phases of migration and helped me in taking some sound decisions." "I have met Natalya when applying for my Spouse Visa in Sydney, Australia. She is a very friendly, trustworthy person with high skills and knowledge. Natalya could explain to me how the system works and gave me specific solutions in a creative way. Natalya and her team always showed transparency regarding my case until the end. I can recommend Natalya as a competent Immigration Agent any time. Keep up your good work and good luck in the future." "Everyone attempting to get Australia's permanent resident understands the demands of the process. Not until I was introduced to mark, I was in that state of distress regarding the matter. I gave him my vote of confidence from the first meeting and since then, under his guidance and his staff members I got my permanent residence in April 2007, it was a dream come true. My sincere gratitude to all the staff of ACACIA immigration who saw me through." "She advises with heart and overall perspective." "On behalf of myself and my family a big thank you for the work you and your team at Acacia have done over the last 18 months in order for us to be granted Permanent Residence. Our application in totality was by no means straight forward, but your ability to adapt strategies to compliment the prevailing circumstances is worthy of commendation. I have therefore no hesitation in recommending Acacia to anyone entering the minefield of immigration to Australia, as without Acacia I would not be here today"
"Natalya was exceptional in helping with my case. She handled everything for me from start to finish and took away a significant amount of difficulties in my path. She also had the right advice at each step and was patient with any amount of my often obscure questions. She has always been professional and courteous too. I highly recommend Natalya." "After speaking to a friend who went through Acacia with Mark Webster, I was shocked to hear the difference of how gaining a visa could be. For the last year all I had heard was how difficult gaining a visa in Australia was, however one friend said it had been very simple, with no dramas and that if I really wanted to stay in Australia that I should see Acacia. When discussing with Natalya about my circumstance, I could see her in-depth knowledge of the industry, the laws, regulations and requirements which put me at ease, and allowed me to continue my focus at work and busy schedule. It only took about 3 meetings with Natalya, a few telephone calls, and some paper work to have everything lodged. A close friend and colleague tried to do the whole process himself, with lots of stress, hassle, time, and in the end being rejected. I run the day to day operations at work, which means I am very busy and have limited time to spend doing my visa. Without the service offered by Acacia and the limited amount of time required by me, I would not have been able to gain my 457 visa and still maintain the day to day operations of the company successfully. Acacia took control of every aspect of the requirement of the 457 visa and simplified it right down to keep it efficient and comprehensive. They dot every I and cross every T, making sure every aspect is methodically covered without requiring much input from the client. I can thoroughly recommend Acacia and Natalya, and have done so, to anyone looking to gain a 457 visa. The cost is minimal when you consider every part of the paper trail is done which such focus and no detail is left untouched. Without Acacia I would not have gained my 457 and would not have the joy of continuing to work in such a strong growing economy with such a great lifestyle that Australia offers." "This is our third 457 being processed by Acacia and being granted, because of your professional services. My case was very complicated from start to end but I really, really appreciate the way you handled it. After my first refusal, Acacia did everything without any charges with same efficiency and faith until the visa was granted. That was unbelievable!! You really followed my case treating it as it very special to you and your services were excellent. I went to Melbourne last year to find some immigration agent, but believe me they charge too much and most of them did not even have knowledge regarding business visas or 457. It was my luck to find you and I have no doubt to say that your services were the best I could ever dream. Thank you soooooooooo much & see you in Australia soooooooon ......"
"I have been recommending to my friends and relatives of Acacia Immigration since 2010. And to those who have availed of your services, they were quite satisfied and happy too." I would definitely recommend Acacia to anybody that is looking for a 457 visa. The service is excellent and Mark clearly knows the legislation like the back of his hand. This is a massive help as one gets professional, accurate advice and can tailor their application accordingly before submission.